A former police lieutenant colonel suspected of helping to perpetrate the murder of Novaya Gazeta journalist Anna Politkovskaya has admitted his guilt and agreed to cooperate with investigators, Kommersant reported on Saturday. 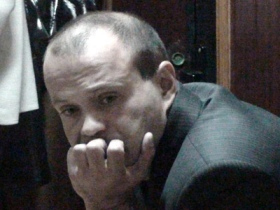 In a full confession that will shorten his own future prison sentence, Dmitri Pavlyuchenkov admitted that he was guilty of aiding in the organization of the murder but was not the main organizer himself. Pavlyuchenkov had originally been maintaining his innocence since his arrest late August. Now, with new evidence from the ex-lieutenant colonel, investigators say that the main suspect in the primary organizing role is Chechen businessman Lom-Ali Gaitukayev, currently sitting out a 15-year prison sentence in Ukraine for organizing the attempted murder of businessman Gennady Korban in March 2006. According to Kommersant, investigators believe that Gaitukayev received an order in July 2006 from an “unidentified figure” to murder Politkovskaya. He then organized a hit team made up of his two nephews, Ibragim and Rustam Makhmudov, as well as Pavlyuchenkov. However, Gaitukayev was arrested the next month in Moscow on an arrest warrant from Ukraine, where he was later convicted of organizing the Korban murder attempt. Without their primary organizer, the hit team spent some time lying in wait before being taken over by Sergei Khadzhikurbanov, a former Moscow police officer. At the time, Khadzhikurbanov had just been released from prison, where he served a term for abuse of authority. Investigators say that he and the other members of the group were given orders by cell phone from Gaitukayev in his detention facility. Pavlyuchenkov admits that he ordered his subordinate officers to spy on the Politkovskaya and determine the pattern of her daily movements around the city. He then gave this information – along with the murder weapon – to the Makhmudov brothers. On October 7, 2006, Rustam Makhmudov shot and killed the journalist in her apartment building’s elevator. Notably, Gaitukayev had previously stated that Anna Politkovskaya’s murder could have been no less than a $2 million job, although he denied having any involvement in it himself. Federal prosecutors say that they no charges are currently being filed against Gaitukayev and his lawyer declined to comment. Kommersant added that it has information that Pavlyuchenkov has provided investigators with the name of the possible “client” in the case – said to be currently abroad – who paid Gaitukayev and the hit team. Federal investigators and the ex-lieutenant colonel declined to discuss the issue. Khadzhikurbanov’s lawyer, Aleksei Mikhalchik, told Kommersant that Pavlyuchenkov was simply providing false evidence to ease his own fate. “I hope the investigation doesn’t rely on his words alone,” he said. Novaya Gazeta Editor-in-Chief Sergei Sokolov commented that Lom-Ali Gaitukayev is not the sort of person who “talks with investigators” and therefore is unlikely to confirm Pavlyuchenkov’s testimony about the alleged client.